There is growing public and industry interest in studying and mitigating the impact of synthetic microfibers released during laundering from entering the world’s oceans. One critical piece in this effort is the development of test methods industry can use to measure microfiber release. Below, Heather Shields, chair of AATCC RA100 Global Sustainability Technology, talks about AATCC’s involvement in this important work. A2: What motivated you to become involved in microfiber water pollution studies and related AATCC test method development? HS: I learned about microfiber issues while at Patagonia. I was in the lab with students from the University of California, Santa Barbara (UCSB). They were washing jackets and measuring the fibers released. I asked them why they were using a washing machine and not an accelerated laundrometer? The latter uses a closed container versus lots of moving parts. I realized that this could be the basis for a new microfiber release test method. This was shared with AATCC Committee RA100, Global Sustainability Technology, and we partnered with industry to begin test method development. A2: Has clothes laundering as a major contributor to synthetic microfiber water pollution been scientifically validated? Are more studies needed? HS: More studies are needed. Laundering is said to be a major contributor to microfiber pollution, but I don’t know how valid this is. There are a large number of fibers in water. 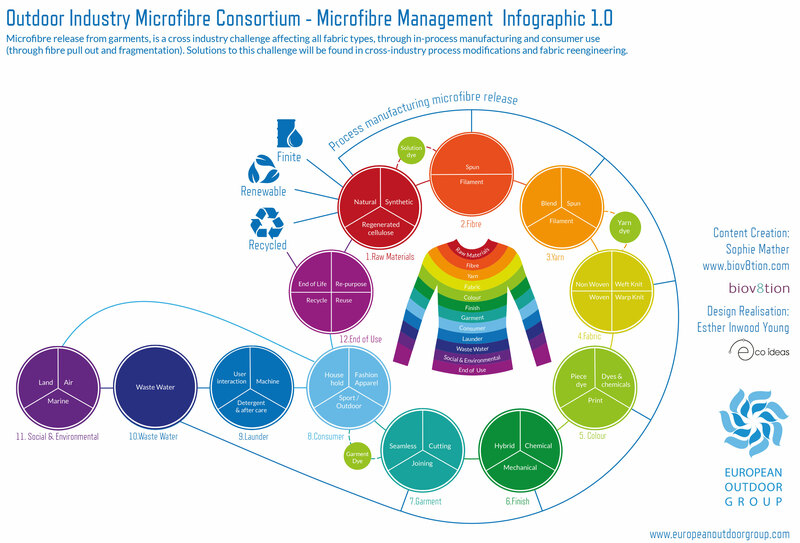 Microfiber release can occur throughout the manufacturing and life cycle of the garment as shown in Outdoor Industry Association (OIA) and European Outdoor Group generated infographics. In addition, to my knowledge, there have been no studies yet on the quantities of microfibers released from water treatment plants. A2: Is there any agreement on the definition of microfiber size? HS: Currently, most people accept the size as determined by the US National Oceanic and Atmospheric Administration (NOAA). They define “microfibers” as fibers less than 5 mm dimension in any direction. No one as yet has defined microfibers in terms of denier or diameter. A2: What factors influence microfiber release during laundering? HS: Fabric physical properties, including construction, behavior under wet abrasion, presence of residual fibers, yarn twist, and breaking strength, all contribute to microfiber release. The AATCC test method under development will allow suppliers and brands to compare various fabric performances with regards to microfiber release. A2: How is the drafting of the new AATCC test method for quantifying microfibers released during laundering proceeding? HS: The method is currently under development and preliminary testing is underway. The Committee used AATCC Test Method 61, Colorfastness to Laundering: Accelerated as the starting point for the new test method. Best specimen size and the effect of the recovered filter mass on method performance are two factors being explored. A2: How can the textile industry begin to address the issues that microfiber-based water pollution poses? HS: For now, begin to have the hard conversations. Get involved with researchers. Consider funding research to determine the extent of the environmental issues posed and potential solutions. Get involved with AATCC to help develop relevant test methods. A2: Are fiber and fabric manufacturers and other stakeholders involved in microfiber research and/or test method development? HS: Yes. Task groups involving manufacturing and brands are working together. For example, the European Outdoor Group has reached agreement with European industry stakeholders to “address the release of microplastic in the aqueous environment.” In North America, OIA and the Sustainable Apparel Coalition are actively getting suppliers, brands, and other stakeholders involved in funding microfiber pollution research. HS: It’s really inspiring to see the industry come together to solve this problem as a group. I’m honored to be a part of the AATCC RA100 Committee, and work and converse with the many experts there. If anyone wants to get involved with RA100’s work on fiber shedding test method development, please contact Valerie Fogg, AATCC Technical Assistant, at +1.919.549.3534 or foggv@aatcc.org.